Beginning five days after Yom Kippur, Sukkot is named after the booths or huts (sukkot in Hebrew) in which Jews are supposed to dwell during this week-long celebration. According to rabbinic tradition, these flimsy sukkot represent the huts in which the Israelites dwelt during their forty years of wandering in the desert after escaping from slavery in Egypt. The festival of Sukkot is one of the three great pilgrimage festivals (chaggim or regalim) of the Jewish year. The origins of Sukkot are found in an ancient autumnal harvest festival. Indeed it is often referred to as hag ha-asif, “The Harvest Festival.” Much of the imagery and ritual of the holiday revolves around rejoicing and thanking God for the completed harvest, and the sukkot represent the huts that farmers would live in during the last hectic period of harvest before the coming of the winter rains. Many of the most popular rituals of Sukkot are practiced in the home. As soon after the conclusion of Yom Kippur as possible, often on the same evening, one is enjoined to begin building the sukkah, or hut, that is the central symbol of the holiday. The sukkah is a flimsy structure with at least three sides, whose roof is made out of thatch or branches, which provides some shade and protection from the sun, but also allows the stars to be seen at night. It is traditional to gaily decorate the sukkah and to spend as much time in it as possible. Weather permitting, meals are eaten in the sukkah, and the hardier among us may also elect to sleep in the sukkah. In a welcoming ceremony called ushpizin, ancestors are symbolically invited to partake in the meals with us. And in commemoration of the bounty of the Holy Land, we hold and shake four species of plants (arba minim), consisting of palm, myrtle, and willow (lulav), together with citron (etrog). During the intermediate days of Sukkot, one is allowed to pursue normal activity. One is nonetheless supposed to hold and wave the lulav and etrog on a daily basis and to eat one’s meals in the sukkah. The central symbol of Sukkot is the eponymous sukkah, the hut in which Jews are supposed to eat and dwell during the holiday, in remembrance of the wanderings of the Jews in the desert after the Exodus from Egypt. Many Jews build their own sukkot (plural of sukkah) in their backyards or elsewhere on their property, while in many cases a communal Sukkah at a synagogue or community center takes the place of the family Sukkah. Oftentimes the decoration of the communal Sukkah becomes a community activity in its own right, with the children in particular getting together and decorating it. Such a Sukkah becomes both a focus of the communal celebration of the holiday and the center of the community’s social life during Sukkot. A major focus of public worship on Sukkot is the waving of the “four species” during communal prayer services. The origin of this custom is a verse in the Torah, according to which the Israelites are commanded to “take the produce of goodly trees, branches of palm trees, boughs of leafy trees, and willows of the brook and you shall rejoice before Adonai your God seven days” (Leviticus 23:40). The rabbinic tradition understood this to mean that one should acquire a lulav and an etrog. A lulav is a palm branch; the branch is placed in a holder together with sprigs of myrtle (aravot) and willow branches (hadasim). These three are collectively referred to as the lulav, since the palm is the dominant feature. The etrog is a variety of citrus fruit also known as a citron. The lulav and etrog are picked up and symbolically waved at different parts of the morning service. When they are all held together and shaken in prayer they are viewed as fulfilling the verse in the book of Psalms (Chapter 35:10), which declares that “All of my bones shall proclaim, ‘O Adonai, who is like You?’” (Leviticus Rabbah 30:14). In this manner, it is symbolic of devoting one’s entire body to the worship and praise of God. 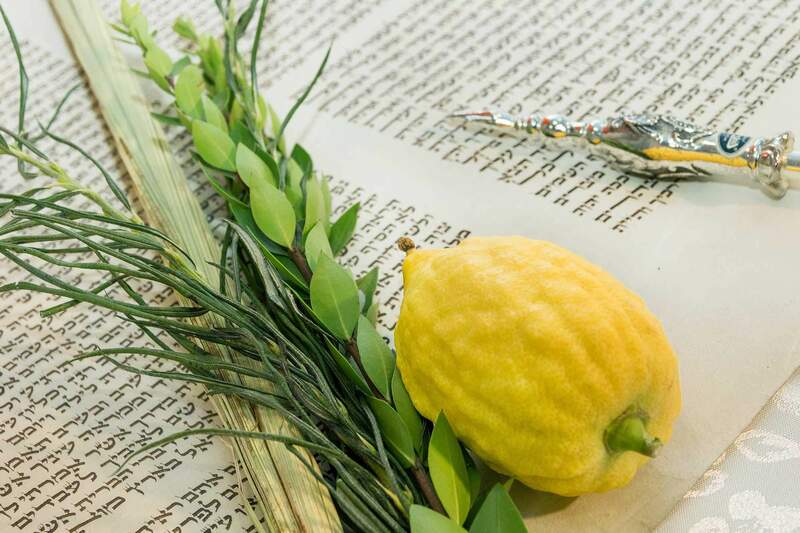 The lulav and etrog are picked up and blessed for the first time during the synagogue services at the beginning of a section of prayers called Hallel or Psalms of Praise (Psalms 113-118). The lulav and etrog are held in one’s hands throughout the joyous singing and recitation of these psalms and are waved in the six directions at three different points in the chanting of these psalms. The lulav and etrog are set aside during the reading of the Torah but picked up again toward the end of the morning synagogue services for a unique ritual called the Hoshanot. The Hebrew word hoshanah means “please save (us)” and is a series of as many as seven liturgical poems calling upon God to rescue and redeem the Jewish people, primarily by sending rain. As an agriculturally based community in the land of Israel, the Jewish people were especially dependent upon the regular, seasonal rainfall to ensure sufficient crops for the community to survive. Because Sukkot falls immediately prior to the beginning of the traditional rainy season in the Middle East, it was considered especially appropriate to petition God for rain at this time. To demonstrate the sincerity and seriousness of the worshippers, the Ark is opened and a Torah is removed from the ark. In a further bid to gain divine favor, everyone carrying a lulav and etrog joins a procession that circles the inside of the sanctuary of the synagogue, chanting and waving his or her lulav and etrog. This procession circling the sanctuary is called a hakkafah (“circling”). A different hoshanah prayer is recited every day of the festival. The seventh day of Sukkot is a semi-holiday in its own right. Still counted among the days of hol hamo’ed (intermediate days of the festival), this day is called, Hoshanah Rabbah or the “great hoshanah.” Hoshanah Rabbah was viewed by the rabbis as a mini-Yom Kippur, a day on which the entire Jewish community is judged by God to be worthy or not of the seasonal rains. All seven hoshanot prayers are recited in seven hakkafot, or processions, around the sanctuary. At the conclusion of this, a special ritual is conducted in which the branches of the willow are struck upon the ground. This is a symbolic attempt to rid ourselves of any remaining sins (the leaves representing these transgressions) that might influence God’s decision to send the seasonal rains. For many Jews, Hoshanah Rabbah is the last day one shakes the lulav and etrog and dwells in the Sukkah (though a number of traditional Jews continue to dwell in the sukkah through Shemini Atzeret). On the evening following Hoshanah Rabbah begins the festival of Shemini Atzeret.